'What does Bhagwat imagine his Sangh followers will do that will protect Mother India?' asks Aakar Patel. The last major war between two States was fought 15 years ago. Saddam Hussain was defeated by George W Bush in 2003 in a one-sided engagement (I am referring here to the initial invasion and not the occupation). The Iraqis had not received modern equipment for many years, and their outdated tanks and fighter jets were no match for American military power. Though both sides went to war with almost equal numbers of soldiers, about 350,000 each, the American casualties were 1/10th that of the Iraqi side, because their equipment was much better. The military hardware that nations spend so much money on usually is used to buy equipment for war between nations, meaning tanks, ships and planes. For example, India's defence budget this year includes over Rs 1 lakh crore for such hardware alone. It has become very obvious to most experts of military strategy that this is materiel that is almost certainly never going to be used except for things like our Republic Day parade. The next modern war between two major nations will be as different from the Iraq war of 2003 as the Iraq war was from the Battle of Plassey in 1757. To understand this we need to ask ourselves what war actually is. A war between States happens when one side is convinced it can compel the other side through force to do what it wants. However, getting the other side to do something can also happen without violence at all. Intelligence agencies in the United States have said that Russia meddled with the American presidential election of 2016. Vladimir Putin wanted Hillary Clinton to lose and Donald Trump to win. There is also the accusation that Trump may have colluded with the Russians in this meddling. This is still being investigated but what is not in doubt is that Putin and his spies meddled and influenced the American election, perhaps decisively. On Friday, February 16, Trump's justice department charged 13 Russians, most from a group called the Internet Research Agency in St Petersburg, Russia. They set up social media accounts on a virtual private network that made it appear that these accounts were being operated from America while they were actually in Russia. The Americans believe that these accounts, on which Putin spent less than Rs 2 crore, helped decide the election in Trump's favour. Why did Russia want Trump to win? Because Hillary would have used sanctions and other means of limiting Russia's influence in the world. Without going to war against America, Putin got what he wanted. I am writing this because of what the Rashtriya Swayamsevak Sangh's chief Mohan Bhagwat has said about war. 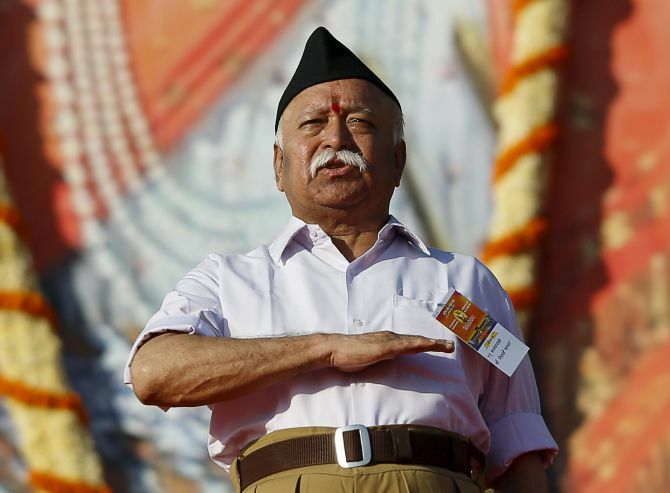 Bhagwat said the RSS could mobilise in three days a force that it could send to the border, though, according to him, the Indian Army would take six months to do the same thing. This was attacked as being anti-army, but I am not going there. My concern is: What does Bhagwat think his militia will do once it is at the border? Does he think, perhaps because of having seen some documentaries of the 1962 war, that the Chinese will come rushing down the mountains with rifles in their hands? And if so what does Bhagwat imagine his Sangh followers will do that will protect Mother India? The RSS shakhas drill the cadre regularly with some physical activity and singing of patriotic songs. This is not the sort of training that is useful even for a war fought 100 years ago, forget today. Modern military drill training for infantry is about 400 years old and has evolved over the centuries. It is in 2018, in the era of guided missiles, totally useless. In a war against a modern nation, our vulnerability will arise not from a lack of volunteers to fight -- the Indian Army is one of the largest in the world -- or from a lack of equipment, meaning not enough tanks or planes. It will be a vulnerability from a lack of technology, which is usually fatal. An advanced nation will focus on disabling the enemy's communications. A shutting down of the Internet will cripple any modern nation today in a way that Iraq could not have been in 2003. The banking system would collapse, and bring the nation to its knees in hours. Internal communications would become so chaotic as to produce panic and disorder. Even purely militarily, just the attack on communications from the outside would defang a nation. For example, the reliance on global positioning systems, which are controlled by the Americans, for aeroplanes and missiles will make them vulnerable, if not useless. Having millions of individuals prepared to martyr themselves will not be of much help. This is the way of warfare today, and if this has not been understood it is not because of a want of information, it is because of ignorance. I thought I should write about this because we should be aware that this is the quality of thinking that informs the RSS, and its products, including our prime minister. It is very primitive and simplistic. It may be burning with patriotism and one doesn't doubt the intent. It is the quality that is alarming and that frightens me. You can read Aakar's earlier columns here.